You can find a place by searching it by name or other specifics. If it is a sight of interest or historic value you usually find an interactive map added.
. Look in the Maps section! Arabic words are spelled in different ways and places has sometimes more names than one. French names and spelling is common. "Khemsa - tletin" (eng. "thirtyfive") because it was 35 km to Essaouira by the old road. Today with the new road the distance is less than 25 km! 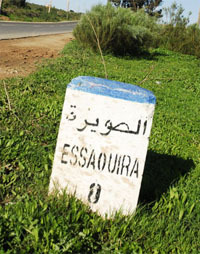 And the village Ghazoua has also the name Km 8 ( "Kilomètre huit" in French) because there are 8 km to Essaouira. The selection of topics is not covering commercial interests such as to buy or rent properties (houses, riads and appartments ), advertising restaurants and cafes - nor is it intended to be an up-to-date touristguide.